(CNS): The four people suspected of staging a robbery at Reggae Money Express earlier this year appeared in Grand Court in front of Justice Harrison last week to address a trial date, but problems over legal representation prevented that from happening. Joseph Suberan, Sanjay Burrell, Emmanuel Wright and Martha Levy were bailed to return on 22 July when it is hoped they will all be represented by a lawyer. Local attorney Ben Tonner, one of three lawyers currently representing one of the four, told the court that “the sticking point on the case moving any further” was finding a fourth legal representative that wasn’t conflicted and prepared to do legal aid work. An increasingly common problem in the local court system, Tonner pointed out that Burrell had been told by the legal aid office that an attorney had been allocated to him, only to find that the lawyer was from the same firm already representing one of the other suspects. With so few firms willing to take on legal aid work, cases involving multiple defendants are continuing to cause difficulties and hold up the system of justice. The four are charge with a variety of different crimes, from possession of an imitation firearm to accessory after the fact, as the prosecution says the suspects were involved in staging what appeared to be a hold up in order to steal from the local money shop, which has since closed down. The crime took place on Saturday, 15 January, at around 6pm when police were told that a man had entered the premises of the Reggae Express cash shop in Elizabethan Square, George Town, with what was believed to be a firearm, threatened staff and made off with a sum of cash. Later that evening police arrested Suberan and Burrell, who were charged with theft, conspiracy to steal and possession of an unlicensed firearm. Wright and Levy, who were arrested soon after the incident, were charged with interfering with a criminal proceeding and theft and accessory after the fact and possession of criminal property, respectively. 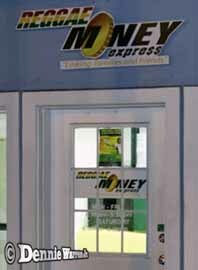 Since the robbery, the Capital and Credit Financial Group (CCFG) which owns Express Remittance Services, the firm which operates the Reggae Money Express stores, closed the Cayman subsidiary as a result of declining business, high operating costs and the robbery, which it said had aggravated the circumstances. "The decision by Capital & Credit to cease business in Cayman was taken due to the increasingly unfavourable market conditions in that territory, which has seen significantly declining remittance numbers, increasingly higher operational costs, and was further aggravated by the recent robbery of the ERS offices in Grand Cayman," spokeswoman Michelle Wilson-Reynolds told The Jamaican Gleaner recently. 16-year-old Ashleigh Hydes, a CNS summer intern, contributed to this report.